A viral pandemic has wiped out parts of the world at an alarming rate. Not knowing what is happening and cut off from the world, they struggled to overcome their fear and confusion with only one goal in mind - STAY ALIVE! For being a short story Josh Atkins managed to pack a lot of detail and story into it. He also managed to make everything feel extremely real. 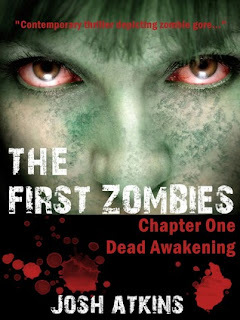 The first chapter will definitely have you hooked. It is a very scary scene (and also a very cruel ironic joke Josh!) I felt like if there was a real life zombie invasion this story would be very close, if not exactly, what would happen. I also felt that the pace of the story was very well done. It never felt rushed or dragged on. Overall I really enjoyed the story and if I had the chance to go back in time and reconsider accepting this book for review I wouldn't. I'm very glad I got the chance to read it, but I did have some minor problems with the story that I have to mention. SPOILER ALERT If you haven't read the story then please just skip down to the overall portion, because there will be spoilers. The first thing is that I wish there was more background information on David, because I didn't understand why he was so eager to hand over control of everything to his friend or why he was so willing to risk his own life. It was almost as if he didn't care if he made it out alive. I just didn't understand why he felt that way. I know it's a short story and that maybe for the purposes of it staying short Josh didn't want to reveal those details just yet, but it just bothered me. Second I don't understand why Mark had to be portrayed as a bad boyfriend. Him hooking up with chicks didn't really add or take away from the story. I wouldn't have minded this minor character flaw about Mark, but he ended up being a really nice guy so it just didn't fit the player ways we learned he had earlier in the story. Third I don't understand why Sandy was so overly thankful to David. I mean yes, he saved her life she owe's him everything, but she was just a little too enthusiastic. It just felt more air headed and less genuine. Lastly I didn't understand the ending. It completely threw me and confused the heck out of me. I didn't understand the little boys part in everything. It just threw me for a loop and made me end the book in a confused slump. I really did enjoy reading The First Zombies. It felt very realistic and that was the number one thing I enjoyed. There were some character flaws that I didn't understand, but think there might be more clarification in later books. The ending was extremely confusing for me and I just didn't understand the little boys part in everything. Overall it was a really great read and I am very glad I got the chance to read it.